It has been suggested that intrasphincteric injection of botulinum toxin (BTX) may represent an alternative therapy to balloon dilatation in achalasia. 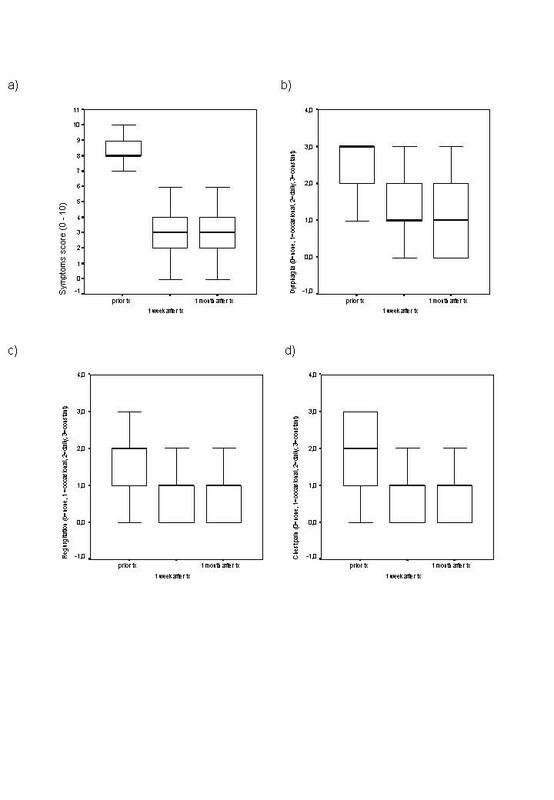 The aim of the present study was to test the effectiveness of botulinum toxin injections in achalasia patients, as assessed using lower oesophageal sphincter pressure (LOSP) and symptom scores, and to compare the response in patients with different types of pretreatment (no previous treatment, balloon dilatation, myotomy, BTX injection). Forty patients who presented with symptomatic achalasia were treated with BTX injection (48 injections in 40 patients). Some of the patients had received prior treatment (seven with myotomy, seven with dilatation and eight with BTX). The symptoms were assessed using a global symptom score (0–10), which was evaluated before treatment, 1 week afterwards, and 1 month afterwards. Manometry was also carried out before and after treatment. Three different selections of patients were studied: all patients; untreated patients; and patients with prior BTX, dilatation, or myotomy. After BTX injection, there was a significant reduction in LOSP (before, 38.2 ± 11.3 mmHg; 1 week after, 20.5 ± 6.9 mmHg; 1 month after, 17.8 ± 6.8 mmHg; P < 0.001). The global symptom score and symptom subscores (dysphagia, regurgitation, chest pain) were significantly decreased after 1 week and 1 month. When the beneficial effects following BTX injection were compared (untreated vs. pretreated), neither changes in LOSP nor beneficial effects on the symptom scores significantly differed. After 6 months, 67.7% of all treated patients were still in symptomatic remission (subgroups: previously untreated patients, 61.5%, n = 26; prior dilatation, 71.4%, n = 7; prior myotomy, 71.4%, n = 7; prior BTX, 73.9%, n = 8). BTX injection offers an alternative treatment for achalasia which is safe and can be performed in an outpatient setting. The initial response to BTX, in terms of symptom scores and LOSP, appears to be independent of any prior treatment. A number of patients do not adequately respond to balloon dilatation or myotomy, which are the first-line treatment modalities in achalasia patients. BTX injection can be performed in these patients, and symptomatic benefit can be expected in the same percentages as with BTX injection in untreated patients. Achalasia is a primary motility disorder of the oesophagus that is characterised by impaired opening of the lower oesophageal sphincter, resulting in delayed oesophageal emptying [1–3]. Morphologically and pathophysiologically, achalasia is characterised by an imbalance of excitatory and inhibitory neural inputs in the lower oesophageal sphincter region  Thus, it has been demonstrated that the neurons containing the inhibitory neurotransmitters nitric oxide and vasoactive intestinal polypeptide (VIP) are specifically absent in the sphincter region [5, 6]. Endoscopic ultrasound or computed tomography (CT) examinations performed in achalasia patients often show a thickening of the muscle layers in the lower oesophageal sphincter (LOS) [7, 8]. Botulinum toxin (BTX), a highly specific toxin, blocks the release of acetylcholine from cholinergic neurons. It can be widely used for injection treatment in several gastrointestinal disorders, including oesophageal disorders such as achalasia, [15–17]. Chagas' disease of the oesophagus  and non-achalasic oesophageal motility disorders such as hypertensive LOS and diffuse oesophageal spasm [19, 20]. In comparison with a placebo injection of saline, BTX leads to significant symptomatic and clinical improvement, as well as a reduction in the oesophageal diameter, LOS pressure and oesophageal emptying time in achalasia patients  However, the mechanism of action and the initial results suggest that one major disadvantage of BTX injection therapy is a gradual waning of its effect, with symptoms recurring after an average of 6–8 months.29 While there is some concern that BTX injection may interfere with subsequent myotomy, no data are available on the influence of pretreatment on the outcome of BTX therapy. It has previously been shown that intrasphincteric injection of botulinum toxin can be used in the treatment of achalasia, leading to an improvement of clinical symptoms and objective parameters, [15, 17] and this finding has been confirmed by several other groups [17, 21–27]. Balloon dilatation and myotomy are the accepted first-line treatments for achalasia patients. The two modalities have long-term failure rates of 15–20% for balloon dilatation and 10–15% for myotomy. BTX treatment, on the other hand, is hampered by a nearly 100% failure rate over time, although some patients may show a prolonged clinical response for more than 6 months after a single injection [17, 22, 28]. The aim of the present study was to evaluate whether pretreatment of any kind affects the symptomatic short-term and long-term outcome, or the reduction in LOSP, after BTX injection. Consecutive patients with symptomatic achalasia referred to the Second Department of Internal Medicine at the Technical University of Munich between January 1994 and April 1999 were included in the study, and were prospectively followed up in a prospective open protocol. All patients included in the study had the characteristic clinical, radiographic and manometric features of achalasia. At their first diagnostic evaluation, all patients underwent extensive biopsies of the cardia region, as well as either endosonography or CT scanning of the cardia region, to rule out secondary achalasia. Exclusion criteria were oesophageal varices, peptic complications (stricture, Barrett's oesophagus) and extra-oesophageal malignant disease. All of the procedures, as well as the functional studies, were performed after written consent had been obtained from the patients; the study protocol was approved by the Ethics Committee of the Technical University of Munich. All patients underwent a pretreatment assessment consisting of oesophageal manometry, upper gastrointestinal endoscopy and barium swallow. After the patients had been provided with extensive information regarding the two endoscopic treatment options and regarding myotomy, the decision on which treatment would be used was made according to each patient's preference. At admission, 1 week, 1 month and then every 6 months after therapy, all patients were evaluated clinically on an outpatient basis or by telephone interview. A manometric evaluation of treatment success was made 7–10 days and 1 month after therapy. The overall clinical assessment (global symptom score) was made using an analogue scale ranging from 0 (no symptoms) to 10 (intolerable), carried out immediately before treatment and then 1 week and 1 month afterwards. In addition, the presence of the symptoms regurgitation, dysphagia and chest pain was evaluated and scored as 0 (none), 1 (occasional), 2 (daily), or 3 (with each meal or constantly)  A global symptom score of less than or equal to 3 was regarded as representing clinical remission. All patients were also questioned regarding symptoms indicating possible complications of the treatment, such as chest pain, fever, weakness of the muscles, phonation problems, and reflux symptoms. Subsequently, the patients were contacted every 6 months and re-evaluated for the presence of clinical symptoms. In addition, the patients were asked to report to the centre if any additional symptoms occurred during this period. Oesophageal manometry was carried out, after the patients had fasted overnight, using a low-compliance perfusion system with a pneumohydraulic perfusion pump (Mui Scientific, Mississauga, Ontario, Canada), with a minimum pressure rise rate of 300 mmHg/s and a standard four-channel manometric catheter with the manometric ports spaced 5 cm apart. The manometric tracings were recorded by a PC Polygraph system (Synectics Medical, Frankfurt, Germany). Manometry was performed using the stationary pull-through method, with the catheter introduced transnasally into the stomach. In patients in whom direct placement was not possible, the manometric tube was advanced into the stomach endoscopically, and the measurements were carried out 2–3 h later. The lower oesophageal sphincter pressure was recorded during the stationary pull-through with all recording sites, and the mean value was used to represent lower oesophageal sphincter pressure; swallowing-induced relaxation was also tested. Ten swallows of 5 mL water were used to determine the oesophageal motility and the LOS relaxation; the contraction amplitude, duration and propagation velocity were determined when possible. For endoscopic injection of BTX, the toxin was dissolved in 5 mL of saline. Botulinum toxin A (Botox®, 100 IU) was dissolved in 5 mL (20 IU/mL). The position of the lower oesophageal sphincter was identified endoscopically by visualisation of the Z-line and the typical narrow segment of the cardia region. The BTX was injected in 1-mL portions using a 7-mm injection needle in all four quadrants of the LOS, in a prograde fashion. The average time needed for the injection procedure was 4.5 min (range 1.5–8.5 min), not including the time needed for cleaning retained food or fluid out of the oesophagus. The procedure was carried out during a 1-day hospital stay in the first nine patients, and on an outpatient basis with the subsequent patients. No radiographic monitoring was used, and the patients were allowed to eat after 2 h when the sedation had worn off. All BTX injections were carried out by a single investigator (H.D.A.). Statistical analysis was conducted using the Wilcoxon test and paired Student's t-test to compare the effect of Btx injection on the patients' symptoms scores or lower oesophageal pressure at the various time points. Differences between previously untreated patients and those who had undergone prior treatment were checked for statistical differences, using the Mann-Whitney test or unpaired Student's t-test. A P value of less than 0.05 was considered to be significant. All statistical analyses were carried out using the Statistical Package for the Social Sciences (SPSS) for Windows programme, version 10.1. Forty patients (25 men, 15 women) with a mean age of 48 ± 17.3 years, were included in the study; the patient data are shown in table 1. Seven patients had undergone prior treatment with pneumatic dilatation before inclusion in the study, and seven patients had received a myotomy before. BTX injection was carried out in the 40 patients after they had provided written consent (26 patients with newly diagnosed achalasia, seven patients with long-term failure of myotomy, seven patients with failure of dilatation). Eight patients in whom BTX injection failed in the shorter or longer term during the study were re-treated with BTX injection, leading to a total of 48 BTX injection procedures during the follow-up period. When all first injections are taken into account, without regard to prior treatment, 31 of the 40 patients (77.5%) were in clinical remission 3 months after a single injection. After 6 months, 26 of the 40 patients (66.7%) were still in remission after a single injection. When repeat injections during the clinical course are taken into account, 31 of the 40 patients (77.5%) were still in remission after 6 months. When multiple injections are taken into account, injection of botulinum toxin led to a good clinical short-term response (4 weeks; global symptom score <3) in 89.7% of the patients. The first BTX injection failed after 4 weeks with in five injections, and after 6 months in eight injections. Four patients in whom injection therapy initially failed (no symptomatic benefit, or benefit for less than 4 weeks) received a repeat injection, and two of the four responded to the repeated treatment. When all first injections in previously untreated achalasia patients are analyzed, 22 of 26 patients showed a good clinical short-term response after 1 month (84.6%); 19 of the 26 patients still had a good result after 3 months (73%); and 16 of the 26 patients still had no need for repeat treatment after 6 months (61.5%) following a single injection. In the seven patients who had previously received dilatation treatment, three had had dilatation 1.5, 2, or 5 years before presentation at our department, and the dilatation procedure had failed at other hospitals in four patients. After BTX injection, six of the seven patients in this group experienced clinical remission for more than 3 months (85.7%), and five had clinical remission for more than 6 months (71.4%). Seven patients in whom myotomy had failed were included in the study. Five of these seven patients were in remission 3 months after the BTX injection (71.4%), and all five were still in remission after 1 year (71.4%). One patient with initial treatment failure received a second injection, which was once again a failure, and one patient received a repeat injection after a period longer than 1 year. Symptom scores (global symptom score; symptom scores for dysphagia, regurgitation and chest pain) and lower oesophageal sphincter pressures were evaluated for each individual patient before the injection, as well as after 1 week and 1 month. When all first injections of BTX (n = 40) are evaluated, there was a significant reduction in the median clinical symptom score (before, 8; 1 month after, 3; Wilcoxon test P < 0.001) and in the median symptom scores for regurgitation (before, 2; after 1 month, 1; P < 0.001), dysphagia (before, 3; after 1 month, 1; P < 0.001), chest pain (before, 2; after 1 month, 1; P < 0.01) (fig. 1A,1B,1C,1D). In the successful cases, the symptomatic response to the BTX injection was accompanied by a reduction in lower oesophageal sphincter pressure; the mean of the lower oesophageal sphincter pressures decreased from 38.2 ± 11.1 mmHg to 20.5 ± 6.7 mmHg 1 week after injection and to 17.8 ± 6.8 mmHg 1 month after injection (paired t-test: P < 0.001) (fig. 2). 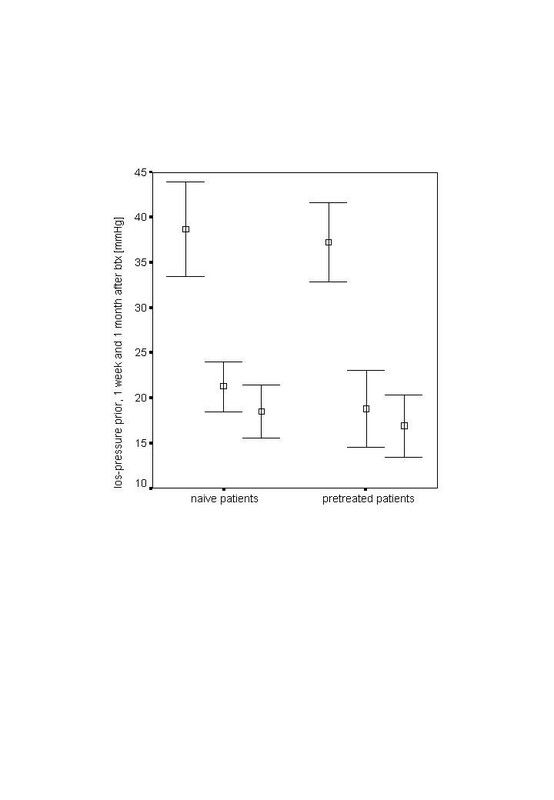 Box plots demonstrating the influence of botulinum toxin injection therapy after 1 week and 1 month on (A) symptom score, (B) dysphagia, (C) regurgitation and (D) chest pain. There was no significant difference in the clinical response to BTX injection among patients (n = 14) who had received treatment prior to the study, in comparison with previously untreated achalasia patients who received BTX as the first treatment (n = 26) (table 2). Five of the seven patients with prior dilatation showed an excellent response to botulinum toxin injection (mean symptom-free interval 797 days), whereas two showed only short clinical responses (43 and 97 days). The patient with a 43-day initial response showed a good clinical response to a second injection (more than 1 year), whereas the other patient failed to respond to a second injection. Sixteen of the 40 patients needed one or more repeat injections during the long-term course of the study (23 injections). When the symptom scores for the re-treated patients were evaluated, no significant difference was found in comparison with the group of first injections in previously untreated achalasia patients (table 3). There were no serious complications or side effects of BTX injection. There were four episodes of chest pain that lasted for up to 4 h after injection, which resolved spontaneously and did not require medical treatment. No other side effects were observed. The present investigation focused on the response to BTX injections in different patient groups. When all first injections are taken into account, the patients showed a good clinical short-term response, in 77.5% after the 3-month evaluation. In the longer term, after 6 months, 66.7% were still in clinical remission after a single injection; and when repeat injections are included, 89.7% of the patients were in remission after 6 months. These findings are in agreement with those of other investigators who have reported comparable success rates. In the shorter term, reported success rates have ranged from 70% to 90% [16, 17, 21, 22, 27, 30]. For the longer-term results after 6 months, including multiple injections, the published success rates range from 44% up to 90%, and the long-term success rates in the present study lie well within this range [16, 17, 21, 22, 27, 30]. Anecdotal reports in the literature have suggested a detrimental effect of preliminary procedures – either pneumatic dilatation or botulinum toxin treatment – on the outcome of surgical Heller myotomy. A retrospective study of 44 patients, including 18 patients who received pneumatic dilatation and 10 patients who received botulinum toxin before pneumatic dilatation, or in whom botulinum toxin injection initially failed, found that these preliminary procedures did not affect the results of myotomy in terms of outcome or complications  An increase in the complication rate (50% with perforation) and a fibrotic lower oesophageal sphincter were observed only in a small subgroup of four patients in whom botulinum toxin injection initially failed  Another investigation analysing 15 patients receiving myotomy after prior BTX treatment reports on difficulties in dissection of the submucosal plane in 8 of the 15 patients and a perforation in 2 of the 15 patients (13,3%) which is a significant higher perforation rate than the perforation rate observed in patients without prior BTX treatment.21 However, these findings were not confirmed in a retrospective study of 92 patients, with results published in 1999 and 2000, including 22 patients who received pneumatic dilatation and 10 patients who received botulinum toxin. These studies did not demonstrate increased complications or a poorer outcome in the pretreated group than in the previously untreated group [32, 33]. The authors did not report finding any fibrotic changes in the lower oesophageal sphincter or increased complication rates among patients who had received prior treatment with botulinum toxin [32, 33]. Pneumatic dilatation and myotomy are currently the two acceptable long-term treatments for oesophageal achalasia. Heller myotomy, either open or laparoscopic, has a success rate of 85–90%. Treatment failures with myotomy constitute a considerable therapeutic problem. Pneumatic balloon dilatation is still the treatment of choice for patients with achalasia, with an overall efficacy rate for excellent or good long-term results of 80–85%. Whereas retrospective studies have shown that myotomy and pneumatic dilatation are equally effective, randomised prospective studies have found that pneumatic dilatation is superior to botulinum toxin injection, since patients treated with botulinum toxin need regular repeat treatments during the further course. From the point of view of cost-effectiveness, pneumatic dilatation is superior to both myotomy  and botulinum toxin injection  The overall complication rate with pneumatic balloon dilatation (3%) is higher than that with botulinum toxin injection, for which – with the exception of one case report of a fatal heart block in a patient with previously known cardiac arrhythmia  – no serious complications have so far been reported. In studies by several groups, intrasphincteric injection of BTX has been shown to be an alternative treatment for achalasia. However, the indication for this treatment is still questionable, since in the literature most patients treated with BTX have required some form of repeat treatment during the further course, mainly involving dilatation or myotomy. On the basis of the present study, BTX injection could be recommended as an alternative treatment – especially in older patients, patients who are at increased risk in dilatation treatment, or those in whom other treatment modalities have failed. A small number of patients have a good and prolonged response after a single BTX injection, without need for further treatment. Taking into account the long-term efficacy and the increasing costs due to the frequent necessity of repeat treatment, BTX injection therapy can only be regarded as an alternative in a minority of patients, such as those who are at increased risk with other modalities (such as dilatation and myotomy). However, treatment failure is a significant risk with pneumatic dilatation and myotomy. In these patients, BTX injection can be used without loss or reduction of efficacy. In conclusion, though the number of patients is low this study shows that the short-term effects of BTX injection in patients with symptomatic achalasia seem to be independent of any possible prior treatment (no previous treatment, myotomy, dilatation, or BTX). This is based on manometric evaluation of the LOS pressure, as well as on the evaluation of the symptom scores. BTX injection therapy can be offered to patients after failure of the first-line treatment options of balloon dilatation and myotomy, and the symptomatic benefit after BTX injections lies within the range of beneficial effects in patients who have not received any prior treatment. An erratum to this article is available at http://dx.doi.org/10.1186/1471-230X-3-32.